By 2020, there will be another cruise line for travelers to consider spending their vacation days on in the form of Virgin Voyages. Originally dubbed Virgin Cruises, Virgin Group founder Sir Richard Branson recently announced the new moniker as a departure from traditional cruising. So, just what might that look like in four years’ time? After all, very little in the way of details has yet to be released beyond specifications for a fleet of three 110,000-ton, 2,800-guest ships being built by Italian Fincantieri though 2022. The only latest information we have is that the line will partner with clean energy system Climeon Ocean. What that style will actually look like is officially unknown. The line’s graphics certainly convey a degree of retro appreciation, but an image search for the brand brings us early renderings that emerged from a lawsuit Colin Veitch, formerly of Norwegian Cruise Line, filed, claiming that Richard Branson and Virgin allegedly stole his ideas on how to join the industry, according to Cruise Industry News. The concept images are considerably more modern than anything afloat today. Until now, bows have either been traditionally extended over the waterline or vertical, but these suggest an inverted variety and lines and colors more reminiscent of sleek Italian sports cars. Architecturally, these designs would certainly make a bold statement, but whether or not they will be realized is still to be seen. At least from a feature standpoint, the Cruise Industry News report shows plans for a translucent skydiving shaft at the stern not unlike what Royal Caribbean International actually installed on its Quantum-class ships as well as a large infinity pool similar to what Viking Ocean Cruises has on its Viking Star and Viking Sea. 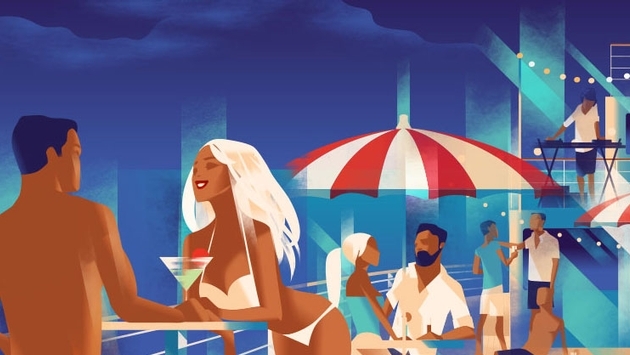 These sketches imply an active lifestyle that would go head to head with a number of mainstream cruise brands like Carnival Cruise Line and Norwegian Cruise Line. Of course, Virgin Voyages president and CEO Tom McAlpin was previously president of Disney Cruise Line, so that still doesn’t rule out the possibility of an aesthetically retro ship geared towards families either, but only time will tell.